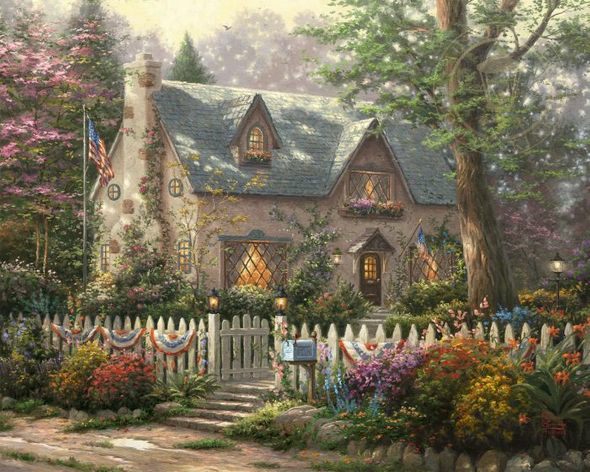 Thomas Kinkade Limited Edition Giclee on Paper and Canvas:"Liberty Lane Cottage"
Dimensions (Sizes): Paper and Canvas in 16" x 20", 20" x 24" and 24" x 30"
About the Art: In creating Liberty Lane Cottage, Thomas Kinkade Studios' purpose was to honor strength and diversity, two of the cornerstones which make the United States the country that it is - a place where individual freedoms are cherished and protected. The strength of a nation cannot be attained or measured by economic power or military might. Strength can only be found where unity welcomes diversity. To those who commit themselves to the dreams and ideas of this country's founding fathers, the gate to our nation, like the one in this painting, stands open, offering liberty, justice, and freedom to all. Much like the various colors, shapes, and textures found in the garden surrounding this New England cottage, as Americans, our differences blend us all together into one beautiful landscape.